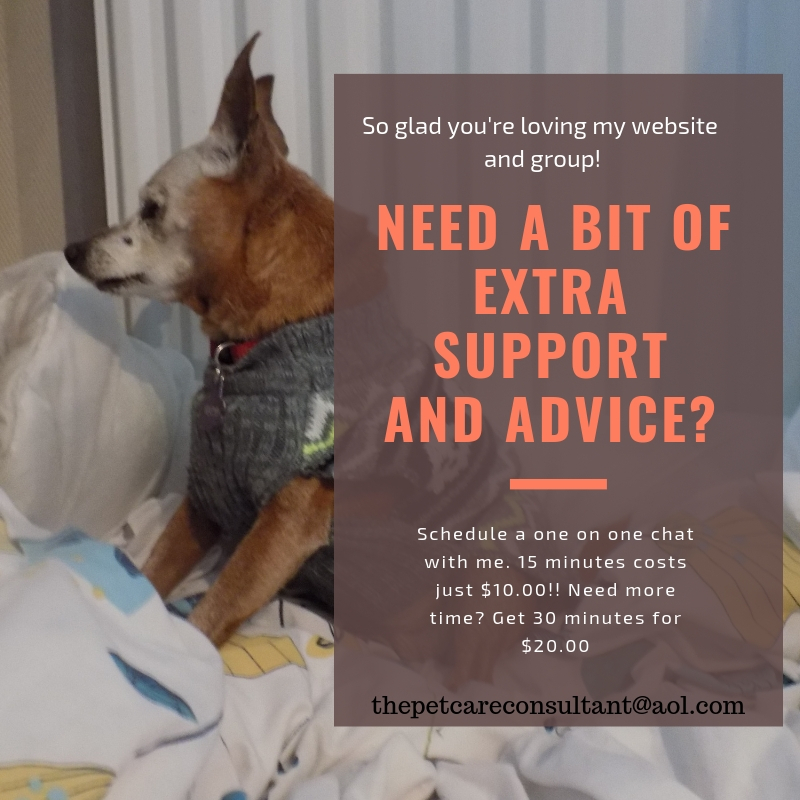 I recently added a new section to my website called Senior Dog Lifesavers. 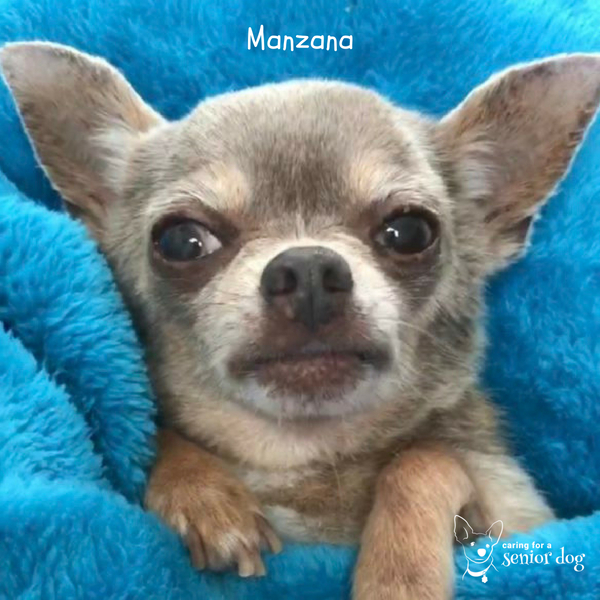 As the name suggests, it is dedicated to highlighting the work of the kind and compassionate souls who rescue senior dogs. A few weeks ago while searching for lifesavers to feature, I came across a woman named Julie Docherty (or Jem as she is called!) 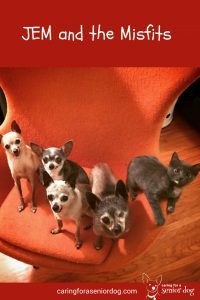 who rescues Chihuahuas. I had to reach out to her and ask if she was interested in participating, and happily she said yes. I hope you find her story as inspiring as I do. When did you adopt your first senior dog? My first adoption was in 2011 with MoMo, who just happened to be a senior. I have more information (and a video) on mywebsite discussing the details, but I fell in love with MoMo from a picture and made the remarkably easy adjustments to bring him into my life and schedule, which included a lot of travel at the time. Momo was a champion travel partner back in the day, and I feel because he was older (and wiser), he was more easy going, relaxed. MoMo just loves people and was a hit everywhere I took him. It was incredible to me that a dog could be so loving to humans, after coming from a situation where they had failed him in so many ways. I’m not traveling as much anymore (which allows me to have 4 dogs and a cat, currently) but MoMo continues to be my champion people person seven wonderful years later. When most people are looking for puppies, what made you want a senior? Once meeting MoMo, the concerns that he was a senior became very secondary. I had never really considered rescuing a senior. I was very naive to the fact that so many senior pets were being dumped in shelters. With the support of the rescue (Tiny Loving Canines) who had pulled him from the shelter’s euthanasia lineup, I was nervous, yet excited to bring MoMo home. We bonded quickly. He still had a few health issues which needed addressing, namely his eye with a ruptured cornea. A graft surgery to save the eye ultimately didn’t take and it had to be removed. I was disappointed about this news, but quickly realized there was nothing that would stop me from loving him. For me, a senior pup was a perfect fit. Yes, MoMo has taken his share of medications and needed some medical care, but puppies still seem so much more work to me. Nothing is getting chewed in our house (none of the pups have teeth left!) and there is no need for long walks to burn off energy. It’s mostly naps and cuddles here. How many senior dogs have you saved? MoMo has had quite a few “siblings” since he’s been with me. I’ve tried fostering pups, but find myself getting irrevocably attached really quickly. I’ve had a handful of success stories, but mostly I discover their homes are with me. So, including MoMo, I’ve personally had 8 senior rescues at various times since 2011. My exception was bringing home a 2 year old Chi I named Frida Kahlo. She had been dumped in a shelter with broken leg bones which had gone untreated for some time. When I got her, I had a friend in mind who I thought she would be the perfect match for. After a year and a half of rehabilitation on Frida’s part, and a little convincing of my friend, the two are now inseparable. This experience with a younger dog helped me to recognize that it was seniors I enjoyed working with the most. Oh, and another exception was made 2 years ago when I brought home Rosita Bonita, a 2 week old kitten found on the streets. She has been raised by her Chihuahua grandparents so I often refer to her as a Cathuahua. 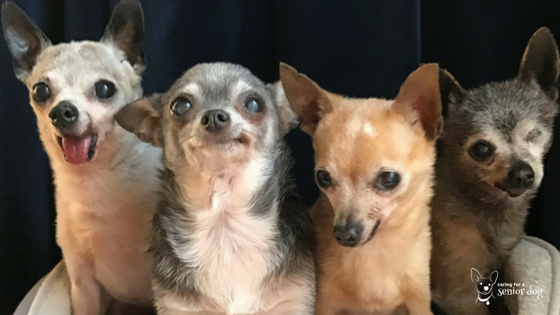 People often ask me “Why just Chihuahuas?”. 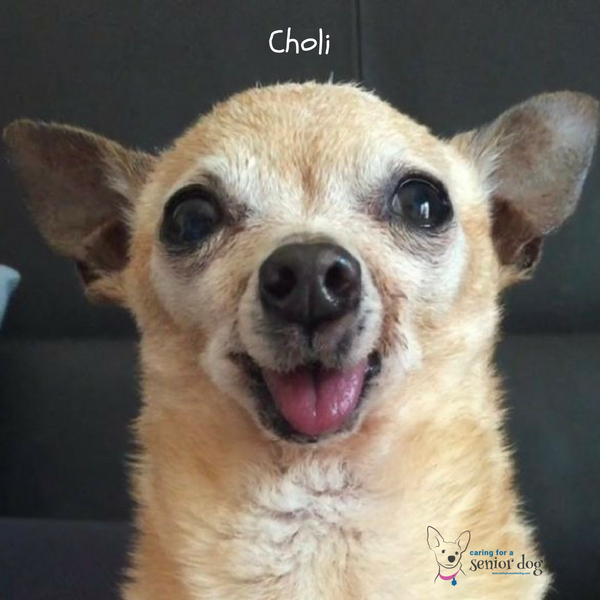 The truth is I love all animals and all dog breeds, I just especially love how Chihuahuas look, and endlessly get a kick out of such big personalities residing in the smallest of packages. 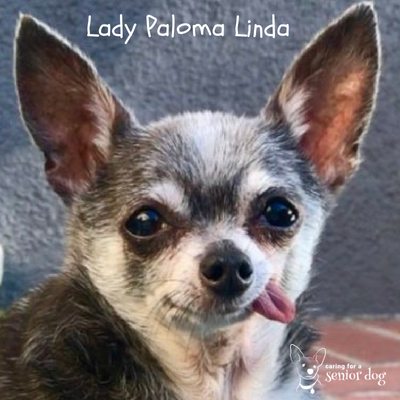 Additionally, Chihuahuas are the second most euthanized breed in America, and in California they are the most euthanized, so the need for homes is great. From careless breeding practices to people not understanding or respecting the commitment of this often long-lived breed, heartbreakingly high kill numbers exist. Where do you find them? Are people calling when they have an old dog to rehome? I’ve been involved with rescues since bringing MoMo home and that is how my pups have found me. As our social media platform has grown, people are reaching out to me about finding homes, but I myself am not a rescue and when I can, I try to redirect them to rescue groups in their area. This new responsibility is always a bit difficult for me, since I’m hearing directly about dogs who have been given up on. I wish I could take them all. What reaction do you typically get from friends, family, people you know when they hear you adopted an old dog? And then another old dog? My family, especially my fiancee is very supportive of me and I’m really grateful for that. I have many friends who are involved with rescue who “get” me, which is essential to have on those challenging days. I also have friends without pets who consider me a crazy Chihuahua person, but in the nicest possible way. I have complete respect for people who love animals, but recognize their lifestyle is not suitable to be a responsible pet owner. When the Misfit family expands and I see bemused looks on peoples faces, I enjoy being an example to them of what is possible with a change in perspective. I think for too long attitudes of animals being disposable has existed. If I can get someone to examine what their values are from seeing what I’m up to, then that feels like a win. 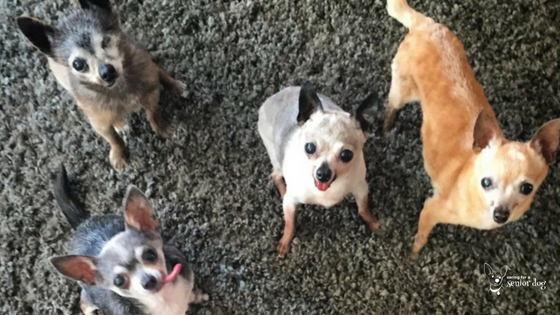 I like to think of Jem and the Misfits as being ambassadors for senior rescue. Our goal is to spread the joy of senior rescue. I realize it’s not for everyone, but I’ve experienced it as a wonderful enrichment to my life and I’m excited to share that. Have you noticed a difference in attitude towards seniors since you started saving them? I feel social media in general is helping to increase compassion for animals. Historically, pretty much anyone would pause to watch a video of baby animals. Now it seems like stories of animal compassion, specifically towards special needs and senior pets, are gaining momentum too. Several featured stories about us have more than 10 million views. I’m not sure if there is a way to measure, but my guess is that senior rescue is becoming more popular. I hope it’s true! One of my favorite kind of comments on our accounts is when people tell me they have been moved to adopt a senior. What has been the toughest background story of one of your dogs? Like most dogs who end up in shelters, my pups all have stories of hardship and neglect. Often I found myself wanting to explain in detail to people what had happened in their past, because I was appalled anyone could treat these loving souls that way. I felt their stories needed to be exposed. While I think it’s really important for people to hear how poorly animals all around us are being treated, I’ve recently learned the value of being careful not to speak about it around my dogs. They don’t need to hear me retell their horror stories, and now that they are happy in their new life we have created a new story together. That being said, all my pups have arrived to me (via their rescue groups) after having been “holding on by a thread”. 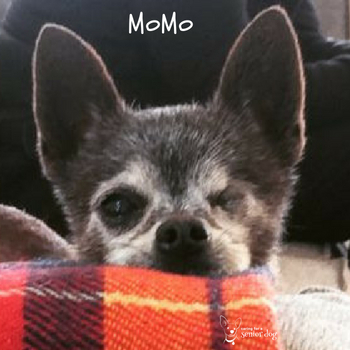 MoMo was emaciated, flea-infested with a painfully damaged eye, Choli arrived to me on a pillow because he couldn’t really stand (he was debilitated from severe dental disease), Paloma was bald and skinny, having been dumped after she stopped producing puppies for a breeder. Their resilience with love and encouragement and good nutrition is a beautiful thing. It’s my honor to be part of this rehabilitation process and help them create their new story. My biggest challenge is something that the pups help me with every day. It’s to stay in the moment. It’s easy to get down, feel overwhelmed, hopeless, or sad about a health challenge with the pups, the reality that our time with be limited, or simply by the sheer numbers of suffering animals out there. Their futures can be scary to think about, their pasts have been heartbreaking, but there is peace and cuddles, joy in the present moment with them, and it’s such a gift. They aren’t dwelling anywhere else but the present, and it’s a beautiful reminder to me. Do you rely on donations to help you care for them? When I adopted Layla I did not want a senior but a middle aged dog only as I wanted to grow old with mine but have so much admiration for those that do. I think it is amazing and brave. My friend has a sanctuary for senior and disabled animals and it is fantastic idea as she is pulling animals from shelters who would otherwise die there and giving them love, a home and all the comforts they need. She relies on donations which is not easy but makes ends meet. It is our plan to increase the age at which we adopt as we’re getting older. Given our circumstances, though, we are limited to adopting only dogs with clean bill of health so we don’t have any conditions that wouldn’t qualify for insurance coverage. We had to turn down our first adoption candidate specifically for that … as she had things in her medical history; and, unfortunately, “mysterious” ones at that. Meaning that technically she could be excluded from most coverage. Lucky bunch of dogs! I love seniors, even though they come with potential medical challenges and the knowing that they won’t be with us long. Hi Holly, they certainly are lucky, Jem is amazing.You’d be surprised how long some seniors can share our lives with. I adopted an 8 year old and she’s still with me 9 years later! !